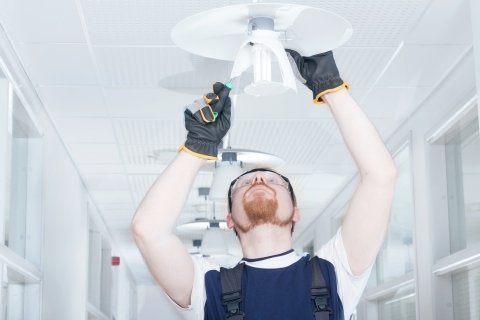 There are lots of ways to reduce lighting costs. The primary method is to switch to LED lights. Our energy-efficient, LED, high-bay fixtures reduce energy consumption by more than 60 percent. Plus, the use of automatic occupancy sensors can save even more energy. Those energy savings translate directly into positive cash-flow for your business, and that’s just the beginning. Using dimmer areas and layering lighting are other methods we can utilize to save your money. The long lifespan of an LED bulb also contributes to savings. On average, an LED fixtures life is five times that of an HID lamp — saving you thousands over the life of your system in replacement costs and maintenance labor costs. • State of the art lighting technology recommendations. • Advanced lighting controls systems. • ROI and payback period calculations. Once accepted, your full-time project manager will provide ongoing support, including management of all utility company rebate and incentive programs. Allow AC Professional Electric to help your business realize the incredible energy savings that are available with today’s lighting and control technologies. Call us today so we can show you how we can increase your company’s bottom line and the value of your business!